Abstract: The Yepp YH-925GS contains a 20GB hard drive and sports a nice bright 1.8 inch, 260K colour LCD screen with a resolution of 160x128 pixels. When Apple introduced the iPod, it was not immediately clear how well the market would respond. The only notable previous attempt at a hard disk-based player, Creative's original Nomad, suffered from poor sales due to its bulk and fragility. Something about the iPod's sleek white appearance and capabilities struck a nerve though, and it has become the 2000's equivalent of the original Sony Walkman, a musical icon and status symbol. Success spawns imitators in any market, and the iPod is no exception to this rule. Many companies have introduced hard disk based MP3 and even video players since, but none have managed to eclipse Apple's product to any significant degree, and its form factor has become the accepted jumping off point for hard drive-based designs. 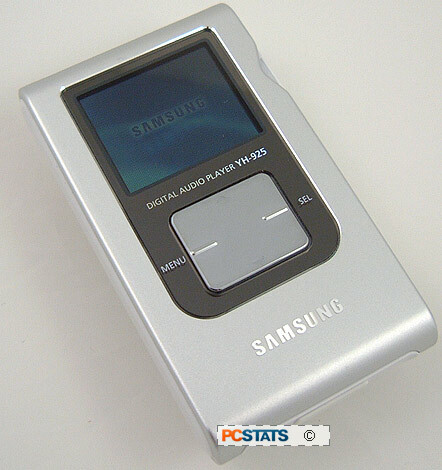 Samsung has had reasonable success with its Yepp line of portable audio players and has recently tried its hand at making larger capacity hard disk-based MP3 players. Not surprisingly these new units resemble the iPod to a certain degree... we've had good experiences with Samsung's MP3 players in the past, so it's time to see if the company can best Apple's strongest product. Printed manual, driver CD, headphones, USB and power cable, direct-connect USB adaptor, USB host adaptor,line-in cable, quick start guide, belt clip, charger. 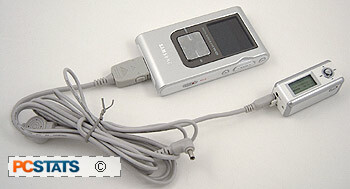 The device in question is of course the Samsung Yepp YH-925GS hard disk MP3 player/photo viewer. This device is the high-end model in Samsung's lineup of hard disk-based players and retails for about $300CDN ($250USD). The Yepp YH-925GS contains a 20GB hard drive and sports a nice bright 1.8 inch, 260K colour LCD screen with a resolution of 160x128 pixels. The Yepp YH-925GS features SRS WOW audio processing abilities, picture storage & playback, and approximately 10 hours of audio playback care of a 3.7V Lithium-ion rechargeable battery. As you'd expect, the YH-925GS can automatically function as a USB-based HDD storage device with any Windows 2000/XP computer as well. It also comes with an initially restrictive list of software it will actually work with, but more on that later. One interesting ability that we don't often see in hard drive players is the Yepp YH-925GS's ability to transfer files to and from other USB storage devices without the need for a computer to act as an intermediary. The package includes a USB host adaptor which can be used to connect the player directly to another USB device for file transfer.